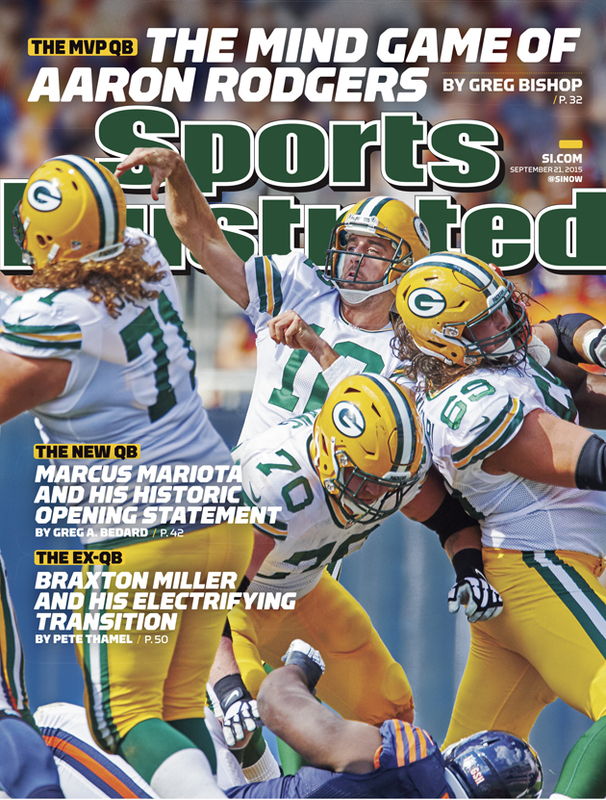 At the start of the NFL season, Green Bay Packers quarterback Aaron Rodgers is featured on the cover of Sports Illustrated. As Green Bay Packers quarterback Aaron Rodgers prepares for a season without his top receiver, the reigning NFL MVP is featured in a Sports Illustrated cover story by Greg Bishop. Rodgers completed 18 of 23 passes for 189 yards and three touchdowns in Sunday’s season opening win over the Chicago Bears. Without Pro Bowl receiver Jordy Nelson, who is out for the year with a torn ACL, Rodgers spread the ball around. He completed passes to five different receivers. Randall Cobb led the Packers with five receptions, and Davante Adams led the team with 59 receiving yards. Rodgers was a first-team All-Pro in 2014, throwing for 38 touchdowns, 4,381 yards and just five interceptions. The Packers won the NFC North and reached the NFC championship game. Bishop’s profile details how Rodgers transitioned from Brett Favre’s backup to MVP and Super Bowl Champion. Bishop examines how Rodgers, 31, manages to constantly improve his game. 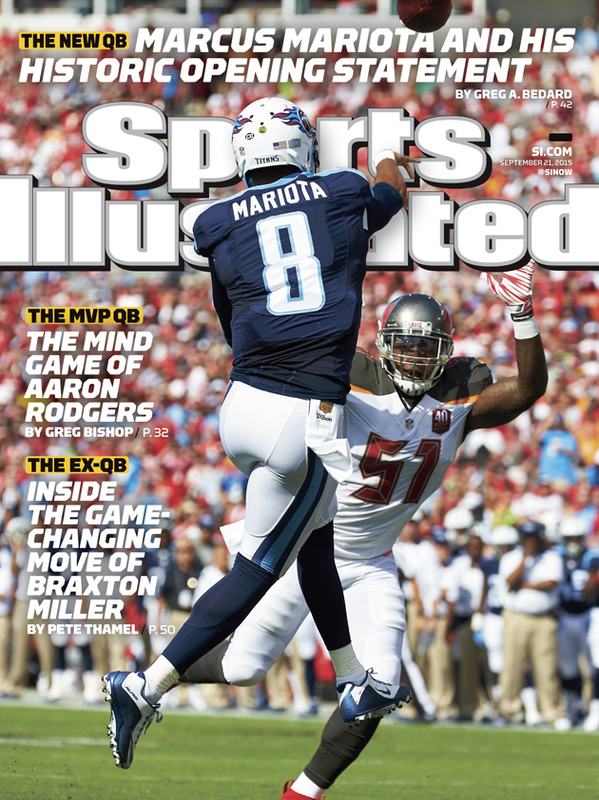 Tennessee Titans quarterback Marcus Mariota is also featured on a regional Sports Illustrated cover. Mariota completed 13 of 16 passes for 209 yards and four touchdowns in his debut, recording a perfect 158.3 passer rating in the team's 42-14 victory over the Buccaneers on Sunday. Also in this issue are stories about Ohio State's Braxton Miller, the 2015 U.S. Open and Dwight Gooden's legendary 1985 season.